Chart of the Day: Brand Personality on Social Media can influence a customer's decision to purchase a product online. The use of Social Media in marketing strategies has become increasingly visible. It is important now more than ever to create a positive brand personality online since consumers spend 30% of their time on social media. First, ask yourself why you use Social Media - to raise brand awareness? To resolve customer service issues? Or, do you have something else in mind? 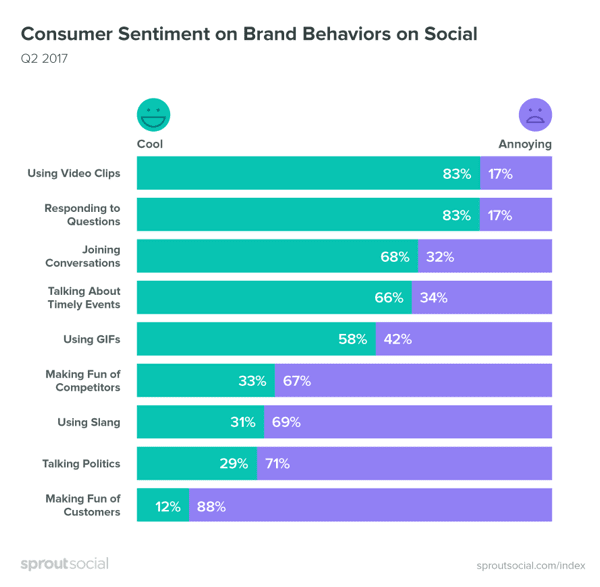 In a recent study by Sprout Social (Q2 2017), they found that consumers preferred a more authentic and honest brand personality (86%) over snarky comments or political content (33%). In addition, 72% of those surveyed said that they are more likely to purchase from a brand if their Social Media image is humorous. Therefore, consumers prefer a brand that is friendly and engages with them; this boosts customer morale, increases brand reputation and influences purchase decisions. Be friendly and approachable with your followers and try to resist any political correctness and competitor slurs - it's only going to put people off buying your product online. It's simple, consumers want honest and friendly content from brands on Social Media. What better way to show this than using video clips to engage your customers. 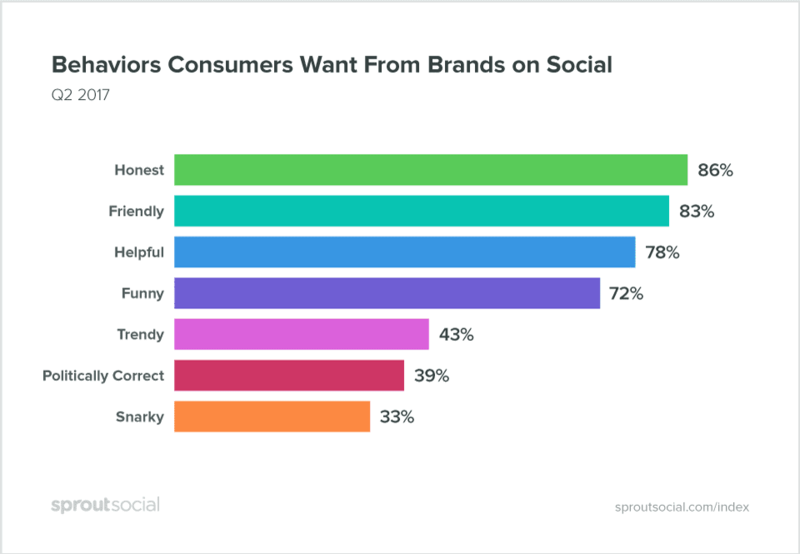 Friendliness is key; over 80% of those surveyed claimed that they prefer brands who respond to questions and engage in joking conversations rather than making fun of competitors (33%), and unsurprisingly making fun of customers (12%). Again, stay away from using political commentary - it's already dominating the Social Media platforms so you don't want your brand and product getting lost in a black hole of political content. Make your product stand out. But, most importantly make yourself stand out. What does this research mean for your business? Remember, there's a thin line between what customers find 'cool' and what they find 'annoying'. 51% of internet users will instantly unfollow a brand if their behavior on Social Media is irritating whilst only 26% of customers will ignore it. Start thinking about what image you want your company to have online to make sure your customers don't unfollow you. Social Media marketing is important to your customers so make it important to you! Have you tried our paid member's Social Media marketing strategy workbook to help you out?